The stylish Aurea, a 70-meter superyacht, brings the luxury lifestyle to the open ocean with its record-sized beach club, spacious outdoor decks and water-level access on each hull side. 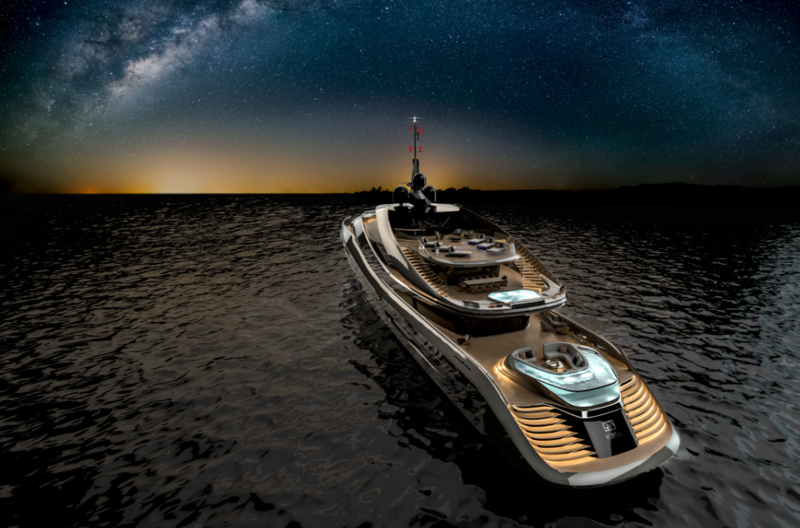 Alongside Rossinavi, this superyacht’s development comes to fruition on the back of Pininfarina, a distinguished Turinese studio which has aided in the design of famed automotive brands such as Lamia, Maserati, Ferrari and Alfa Romeo. Indeed, guests aboard the Aurea will experience richness and splendor, the vast sea before them. Designers of the Aurea drew inspiration from the ‘Golden Section,’ a mathematical ratio believed to form the most aesthetically-pleasing images in nature, architecture and design. The ocean and marine life were also points of inspiration for the design team, which is where the ship’s fluid lines and opulent seashell patterns stem from. During the project’s conception, Rossinavi understood that, as we shift culturally and technologically, the Aurea should serve as an innovative design. Consequently, Rossinavi worked closely with University of Monaco student designers to recognize the millennial market’s tastes. However, through its simple style and elegance, the Aurea undoubtedly appeals to any generation. The Aurea boasts a polished chamfered cut from bow to stern, with the longitudinal balcony and vast windows shaping the hull. The windows give peeks into the classy cabin rooms, where guests can relax in the evenings and wake up to beautiful natural light in the mornings. Fine dining is available throughout the day, alongside various venues for entertainment. Two swimming pools and the exclusive beach club are just a few of the available options. Lastly, the hull frames the Aurea’s stunning lamellar staircase, a detail iconic to Pininfarina’s classic car designs.